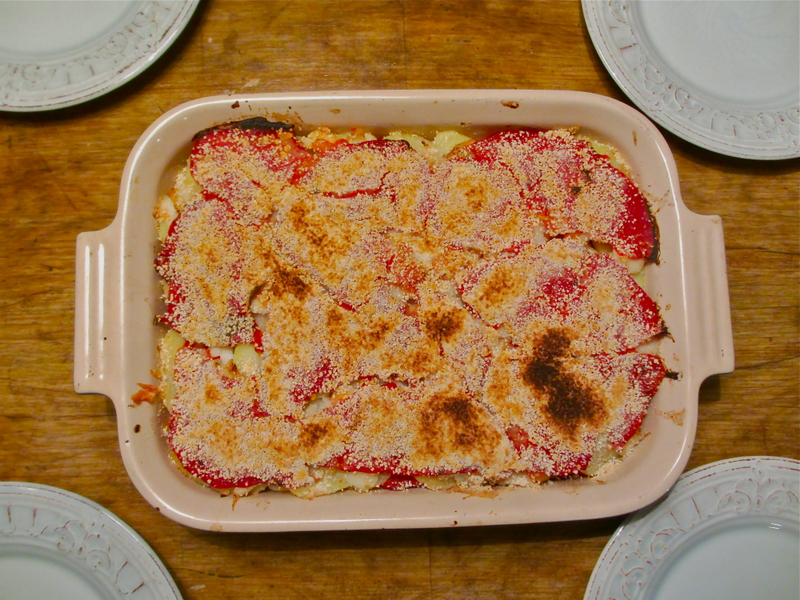 Last chance: This gratin would pass the family test – or not; and might have ended my love affair with cured fish. Cured cod has many names all around the world – you may know it as Bacalhau (which is the most famous Portuguese variety), as Stockfish maybe (very common), as Klippfisch (as some Germans say). But the French have it, as always, totally different: they say Morue. It’s cod. Dried and salted. Or just salted. Back in my childhood, my mother served it on Holy Fridays as if it was a sacred dish. 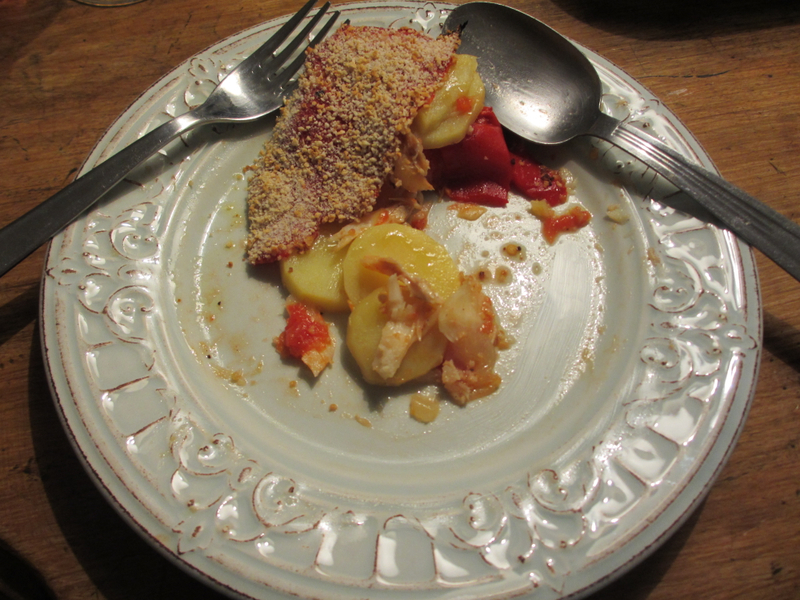 Fish, potatoes, peppers, onions, bread crumbs – can it work out? least since the railways linked the cities to the coastlines). But there’s a significant Portuguese population in France nowadays and they kept that somewhat weird fish product alive. I mean: Why would you eat fish nowadays the way the old explorers did out of their sheer necessity to store food for year-long sailing trips (without refrigerators)? Well, my answer is: Because it is still an interesting, even fascinating affair. It not only links you to, say, Vasco da Gama & Co., it leads you back to a century-old poor people’s kitchen while it also represents quite a cooking challenge. The fish – hard and dry as it is – has to be de-salted and softened for days. After that, you can’t just cook it; there’s always a good chance to ruin its texture. You have to master temperatures and liquids (like the classic, laborious French fish stock fumet) and you’ll surely get your hands dirty when finally pulling apart the fish which, again, will only be another step in the long course of preparing a meal. Still. Whenever I saw the grayish, uninviting chunks of dry fish at a market I couldn’t help thinking of what to do with them. I admit that, so far, I have always failed to turn them into a significant or at least pleasant dish. Last night, I tried it again. It was a moment of decision-making. I would either create something alright – or never touch a Morue again. I combined it with potatoes (pre-cooked in the fish broth), aristocratic pimientos del picillo, white onions fried in excellent olive oil. 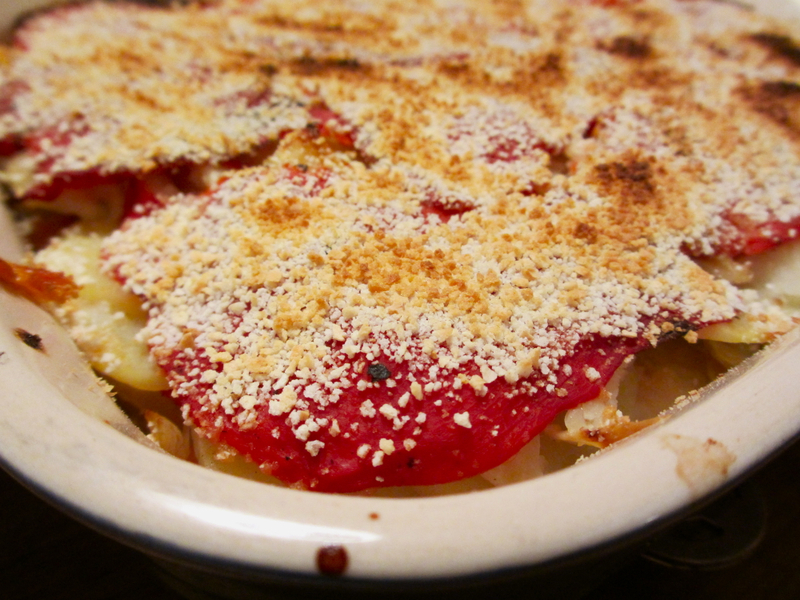 I added black pepper, I sprinkled generously with breadcrumbs – and put the dish in the oven for 30 minutes. My family played the jury and I felt like a candidate of The Voice. First, they didn’t say much but ate with good appetite. Then, my wife said: “Not bad, actually”, which wasn’t bad at all. My sons just finished their plates and wanted more. And more. 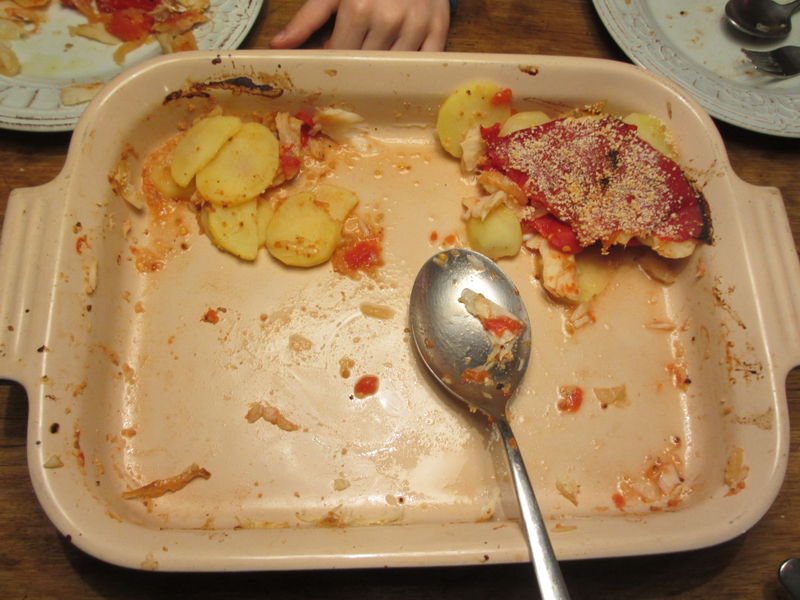 And after a couple of minutes the whole dish was empty and my Gratin de Morue was gone. It passed the test. I’ll do it again. Cooking means taking risks. On the finish line: my younger son took this last spoon full, too. I’ll do it again. It looks like a fantastic morue dish! I love it even though I have never liked fresh cod (I still don’t understand why it’s so expensive…) and have always found it bland. I think that once salted and dried, the cod becomes an incredibly interesting flavoursome fish! I would rather say that its presence in France is due to the French Caribbean territories (although people with Portuguese origins certainly buy it too)… because the most famous cod dish seems to be fritters called Acras de morue. Have you had them? I have posted a recipe a long time ago (http://www.withaglass.com/?p=36 sorry for the awful photo) but I prepare it the same way all the time. I have tasted them before from different “traiteurs”, but they are the best when made at home: they absorb strangely a minimal amount of fat and are delicious served with hot sauce (now I’m really hungry!). I must try making new dishes with salted cod… thank you for the inspiration! you’re absolutely right – there is this French Caribbean tradition and Accras de Morue makes part of it. But you know what? In over ten years I’ve never seen them here in Paris. I’ve checked your recipe though (you say it was posted a “long time ago” meaning in fact not much more than one year ago) – and I’ll try it! You know what won me over? Your very plausible phrase about the salty thing not taking in all the frying fat. Of course! Makes sense! But you know what? I don’t agree with you on the uncured cod. I can see your point. But, for instance, oven-baked, sprinkled with olive oil and oregano (I hate to say it, but that’s like Jamie Oliver suggests it – and he’s right!) it can be a real treat. Thank you, Amy, I agree with you: quite often you can “see” before tasting whether a dish is good – or not.